Welcome to Barkman & Smith Physical Therapy's guide to adult wrist fractures. Fractures of the wrist are common injuries. When you fall, it is only natural to put your hand out to break the fall and prevent more serious injuries to your face and body. The forces that go through your wrist when you fall on your outstretched hand are many times the weight of the body. Conditions that make a fall more likely, such as icy, wet, or uneven surfaces can increase the risk of a wrist fracture. A strong pain-free wrist is needed for everyday activities like lifting, gripping and carrying. The wrist is also important for positioning the hand in space, so an injury to this region can be very debilitating and must be treated carefully to preserve function. Despite being such a common injury, there are a variety of fractures that can occur and such a large number of treatment options that there are still gaps in our knowledge and uncertainties about how to treat each individual wrist fracture. The wrist is not a bone but rather a joint between the two bones of the forearm (the radius and the ulna) and the carpal bones of the wrist. The hand is a collection of small thin bones called the metacarpals and the phalanges. The two rows of carpal bones sit between the bones of the forearm and the metacarpal bones of the hand. The end of the radius is a shallow cup. The shape of the bones alone is not enough to make the wrist a "stable" joint when compared to a joint like the hip. Strong ligaments attach all the bones of the wrist together, which keeps the joints stable and limits excess movement. The radio-carpal ligament complex goes from the tip of the radius (called the radial styloid) and spreads out to attach to several bones of the wrist. This ligament is stretched by ulnar deviation (tilting the wrist towards the baby finger side) and also limits the total amount of ulnar deviation available. The equivalent ligament on the ulnar side goes from the ulnar styloid and limits radial deviation (tilting toward the thumb). Aside from ulnar and radial deviation, the other movements at the radiocarpal joint are flexion (bending forward at the wrist) and extension (bending back). 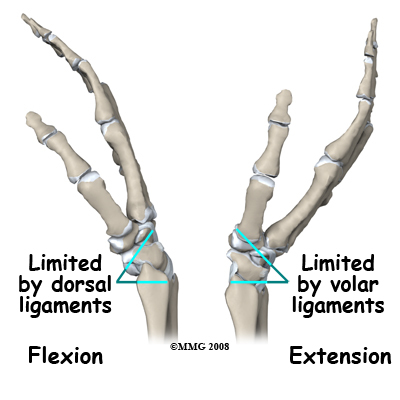 The ligaments of the wrist joint that are on the back and front limit these movements. Rotation of the wrist is a combination of these motions. 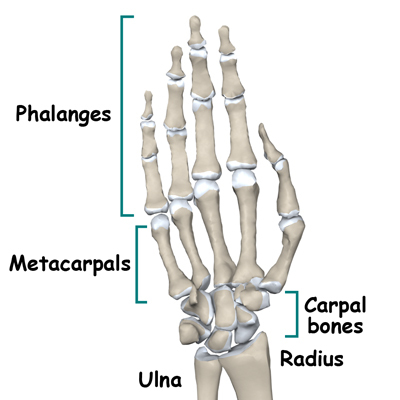 The end of the ulna does not actually contact the carpal bones. There is a disk of fibrous material called the triangular fibrocartilage (or "TFC") in between. 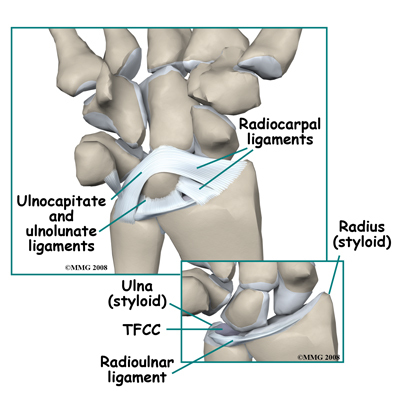 The TFC also connects to the radius bone and to the ulnar styloid. This disk together with the ligaments coming from the ulna and the radius are referred to as the TFCC or triangular fibrocartilage complex. The distal radioulnar joint (DRUJ) has a very important movement associated with it that makes your hand very functional: rotation of the forearm. Normally, without any injury, you can place your hand and forearm on a table-top either palm down or palm up. The ulna acts as the axis of rotation and the radius rolls around it. If your lay your uninjured arm on a table palm downwards then roll it to the palm up position you will note that the little finger stays in much the same position while the thumb moves from the inside to the outside. 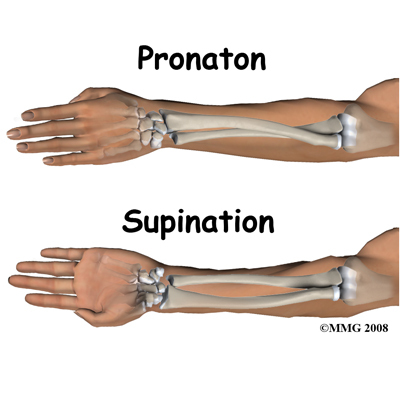 These movements are called pronation and supination. Important nerves, arteries and tendons pass over the wrist joint and may be injured in a fracture. The tendons that move the fingers take origin from muscles in the forearm. Those that bend the fingers (flexors) pass close to the bone on the palmar side of the hand. In a displaced fracture they can be lacerated or get trapped between the fracture fragments. The median nerve, which runs down the front of the forearm, can be injured by a fall on the outstretched hand. This nerve supplies sensation to the thumb side of the hand. Both the median nerve and the tendons of the fingers travel through a space called the carpal tunnel into the hand. Bleeding into this space and pressure on the nerve by fracture fragments can compress the median nerve, all of which cause an acute carpal tunnel syndrome. The ulnar nerve, which runs along the inside of the elbow and the inside of the forearm, may also be injured in a wrist fracture. The arteries to the hand are not usually damaged in a typical wrist fracture but should be carefully examined. 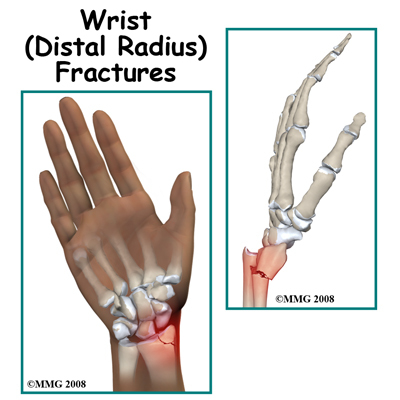 How do fractures of the wrist commonly happen? The most common mechanism of injury for a wrist fracture is a fall on the outstretched hand. The broken end of the radius is pushed up and back relative to the rest of the forearm. This causes a deformity of the forearm and wrist that looks like a "dinner-fork". Dr. Abraham Colles recognized this appearance of the wrist as a sign of a fracture nearly 200 years ago long before the invention of X-rays. 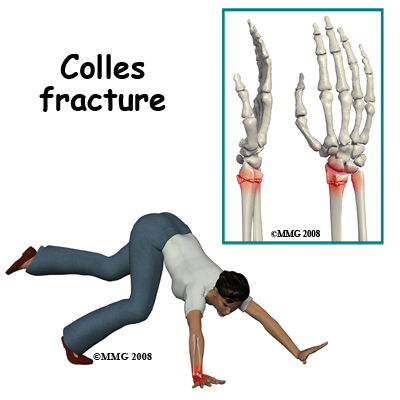 For this reason, a wrist fracture is still commonly called a "Colles' Fracture". 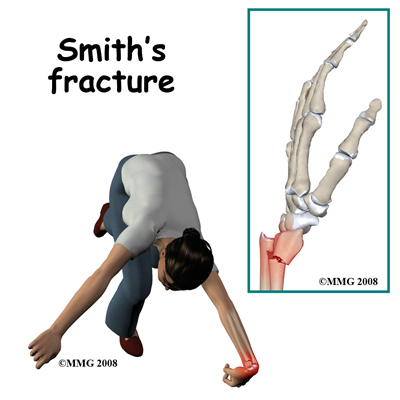 Although this pattern is common, there are actually several other fracture patterns giving rise to a confusing number of names such as a Smiths Fracture, Barton's, Die-punch, Galeazzi, and others. Each of these types of fractures has different fracture patterns and different causes. In the elderly, simple falls are by far the most common reason for a wrist fracture. In younger people it takes more force to break the bone so distal radius fractures are seen following higher energy events such as motor vehicle accidents, falls from a height, industrial accidents, and sports injuries. Getting your hand caught in machinery can result in a very severe distal radius fracture. Open fractures, where the bone breaks through and opens up the skin, are relatively rare but may occur in high-energy accidents. What types of fractures can occur? Doctors prefer to call wrist fractures distal radius fractures because this is more descriptive and more accurate regarding the location of the fracture. There are a wide variety of fracture patterns depending on the direction and amount of the injuring force, the position of the wrist when it was injured and the inherent strength of the bone. Another very important way to classify these fractures is as unstable or stable. In unstable fractures, the fracture fragments are highly likely to move further out of position during the healing period. The bone fragments are weak and may compress (crumble) further. They can be pulled further out of position by forces from muscles, ligaments, and other bone fragments. Stable fractures are ones that are not likely to move further out of position. Whether a fracture is stable or unstable is an important judgment call by the treating doctor and may well affect the mode of treatment. As mentioned above, wrist fractures most commonly occur when you fall on the outstretched hand. The wrist is usually extended (bent back) and pronated (palm down) so that the palm of the hand hits the ground. The force of the fall pushes the wrist into further extension, and often radial deviation. The force causes the bone at the end of the radius to break. In addition, the radial deviation may stress the ulnocarpal ligament, which often pulls off (or avulses) the small ulnar styloid. Unfortunately, the compressive force on the end of the radius is often enough to crush the bone into multiple pieces. This means that the bone fragments are squashed and no longer their normal shape. For this reason, even if the fragments are put back together the healed bone may not return to its normal shape. A distal radius fracture is a common "Fragility Fracture" in the elderly. A fragility fracture is a fracture that results from mechanical forces that would not ordinarily cause a fracture in a healthy young adult. The fracture is a sign that osteoporosis has affected the bones. In younger people, it takes a good deal of force to break the wrist. A distal radius fracture in a young person prompts a careful search for other concurrent injuries due to the force that would have been involved. What symptoms do wrist fractures cause? Pain in the wrist following an accident or fall is the hallmark of a fracture. The pain and tenderness is felt at the lower end of the forearm and is made worse by any movement of the hand or by rotating the forearm. Deformity of the wrist area is commonly seen with the hand being carried back above the line of the forearm. Within a few minutes of the injury you will also notice swelling of the wrist and hand. If the nerves to the hand have been stretched or compressed you may experience numbness in the fingers or thumb. If tendons are trapped you may find that the fingers are bent and cannot be straightened. Bruising of the region and fracture blisters may be seen within a few hours of the injury. The symptoms of pain, swelling, and bruising will continue for several days. They are caused, in part, by the injury to the muscles of the region and by bleeding into the tissues from the broken bone fragments. This "soft tissue injury" resolves slowly as the body reabsorbs the swelling and converts the blood collections into scar tissue. Treatment of the fracture is focused on keeping the bone fragments immobile in an acceptable position until the bones heal. This treatment does not speed up the resolution of the soft tissue injury, although it may help with the pain from the bone fragments themselves. At the scene of the accident, first aid for a broken wrist should include splinting the wrist and applying a sling. The patient should be carefully examined for wounds and loss of sensation in the hand, and transported to hospital as soon as possible. In the Emergency Room (ER), the focus of the evaluation will be on treating shock and pain, making sure that the injury is accurately diagnosed, and that no other injuries are present. It is necessary to examine the whole arm so clothing must be removed and this may mean cutting it off to prevent further pain or injury. Any wounds should be dressed. The wrist region will be x-rayed. This may include the forearm and elbow if there is suspicion of injury further up the arm. At least two x-ray views are normally taken; an antero-posterior (AP) with the back of the hand on the film, and a lateral (from the side). In a lot of situations the finding of a wrist fracture will result in referral to an orthopaedic surgeon, however, some fractures may be treated initially by the ER doctor and then followed by your family doctor. The evaluation by the orthopaedic surgeon will include getting a history of the accident and the symptoms. Both the wrist and arm will be examined and your general medical status will be evaluated. The x-rays will be reviewed. Often no further radiology tests are needed but sometimes a Computerized Tomography (CT) scan is done to show all the bone fragments of a complex fracture. The surgeon will then discuss the prognosis of your injury and the treatment options. This discussion will take into account the type of fracture, your expectations and functional demands, and your health status. The consequences and potential complications of each treatment option will also be discussed. Your input into the treatment choice is very important. There are a wide variety of treatment options available to treat distal radius fractures. Non-operative treatment is the mainstay of treatment, particularly in the elderly. Long experience has shown that although these fractures may not heal in perfect alignment, this does not usually cause a significant loss of function in the elderly population. The risks associated with surgery and anesthesia makes the choice of non-operative treatment attractive. Some fractures, however, do need to be treated by surgery. During the last few years, a number of new surgical techniques and implants have been developed. These new tools and techniques are more successful at holding the bone fragments in a good position while the fracture heals. These improvements have prompted a re-evaluation of surgery as a treatment for many wrist fractures. Today, improvements in anesthetic technique and surgical implants have made surgery a good option for all unstable wrist fractures. If the fracture is stable and non-displaced then its position does not need to be improved by manipulation, which means moving the bones. These fractures can be treated in a cast. Treating with a cast accomplishes three of the goals of treatment; it improves the pain by splinting the fracture very securely; it protects the fracture; and lastly, it makes it more likely that the fracture fragments will stay in position by preventing movement of the wrist. 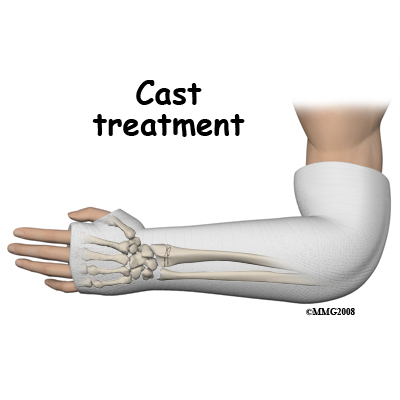 A cast must be tight enough to hold the forearm and wrist securely but not so tight that it compresses the damaged and swollen tissues of the forearm. This can be a difficult issue because the region is usually very swollen at the time the cast is put on. In addition, there is often more swelling in the following few days after the cast is put on so the cast may get even tighter. As the swelling goes down it may then get too loose. Monitoring the circulation and sensation in your fingers is important to ensure that the cast is not too tight. To combat the problem of the cast becoming too tight with increased swelling quite often the cast is "split" right after it has hardened. A small strip of plaster is removed down one side of the cast and the padding is cut to allow the cast to spread apart if the arm swells. When the swelling has gone down the cast can be closed up again to tighten it around the arm. Another popular stabilization option is to splint the wrist with a "slab" of plaster for the first few days and apply a cast once the swelling has gone down. Follow-up of a fracture in a cast may require frequent visits to the cast clinic. The doctor needs to know that the cast is fitting comfortably and that the fracture has not shifted too far out of position. This usually involves repeat x-rays at intervals during the healing period. It is sometimes necessary to replace the cast. If the cast becomes loose, gets wet, or breaks it should be replaced immediately. This can normally be done in the doctor’s office without the need for anesthesia. Some patients wonder how the cast can be cut without cutting the skin. The cast cutter is a special type of saw. Although a cast cutter looks like a regular saw, it works by vibration. The blade only rotates a few millimeters then reverses. Anything hard, like the cast, resists this small movement and is cut. Anything soft and giving, like your skin, will vibrate with the cutter and all you will feel is a buzz. In rare cases if the skin is so tense that it doesn't move when a cast cutter blade touches it, you can get a small cut, therefore if you do feel any pain with the cast cutter, say so immediately. Your cast will be removed when there is evidence of bone healing on x-ray. At six weeks there is usually enough new bone formation (callus) to allow for removal of the cast. This new bone is still quite weak though and you should protect the fracture for a few weeks longer. Sometimes protecting it after the cast is removed means wearing a removable splint. You can take off the splint to do rehabilitation (see below) however, you should not use the wrist for heavy activity until the doctor is satisfied that the fracture is adequately healed. Frequently the position of the fracture is not acceptable. The angulation or the impaction is so severe that the function of the wrist would be impaired if allowed to heal in this position. In these cases, the surgeon may opt to improve the position of the fracture by manipulating it. This is called a fracture reduction. Manipulating a fracture is painful and requires a general, local, or regional anesthetic. Regional anesthesia is accomplished by injecting a local anesthetic into the armpit next to the nerves that run to the hand. This makes the entire arm numb for about two hours. This is called an axillary nerve block. Another valuable regional anesthesia technique is an intravenous block. A tourniquet stops the circulation to the arm and local anesthetic is injected into the venous system. This makes the arm numb from the tourniquet down to the hand. A third option is to inject local anesthetic directly into the fracture site. This is called a hematoma block. These anesthetic techniques eliminate all painful sensations from the fracture and allow the doctor to manipulate the fracture fragments into an improved position. Once that has been done the wrist is splinted to allow the swelling to go down, and a cast is applied either immediately or a bit later. An immediate x-ray is taken to make sure that the fracture position is now acceptable. Some surgeons prefer to include the elbow in the cast after a closed reduction. This eliminates rotation of the forearm and may reduce the likelihood that the fracture position will move, or displace. Although a closed reduction and cast improve the position of the fracture fragments, there is no certainty that the position will be maintained all the way through the healing period. The muscles that move the wrist and fingers all cross the fracture site. As they contract they put a compressive force on the fracture. In unstable fractures, some settling of the fracture may occur. This may result in recurrence of deformity at the fracture site and may require more aggressive treatment. When more control of the fracture fragments is necessary, some type of surgical intervention is usually required. One minimally invasive option is to perform a closed reduction and pinning of the fracture. This procedure is suggested when the fracture is considered unstable, but the fragments can be manipulated into an acceptable position. Driving smooth sterile stainless steel pins through the skin and across the fracture stabilizes the fragments. The ends of the pins are cut outside the skin and bent to prevent them migrating any deeper. This procedure is performed in the operating room using a special x-ray machine called a fluoroscope. This machine projects an x-ray image on a TV screen and allows the surgeon to see the fracture fragments as the pins are being inserted. The procedure requires some type of anesthesia, either a general anesthetic or a regional block. After this procedure is complete the wrist is dressed and a cast is applied. Once the fracture has healed and is stable the pins are removed. The pins are smooth so they come out easily and an anesthetic is not required for this procedure. The pins may hold the fracture fragments in the correct relationship but they may not prevent the fracture from impacting further if the bone is crushed or very fragile. Another method of stabilizing the unstable fracture is the external fixator. After the fracture is manipulated into a better position, special threaded pins are drilled into the bone above and below the fracture. These pins are connected by a system of rods. This procedure also requires a fluoroscope and some type of anesthesia, either a general anesthetic or a regional block. 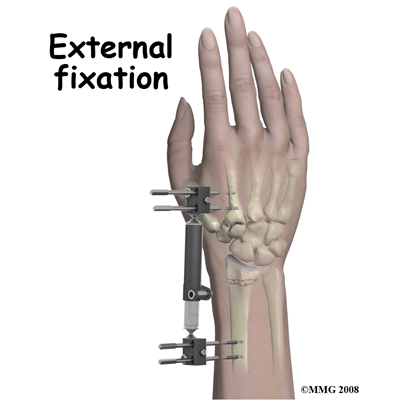 The external fixator apparatus allows the surgeon to distract the fracture, which keeps tension on it so that it is less likely to shorten and collapse. The external fixator also holds the fracture immobile so a cast is not needed. The apparatus is maintained until fracture healing has advanced and the fracture is stable at which time the pins are then removed. Usually there is minimal discomfort and this can be done without anesthesia. Unfortunately, in some cases this apparatus may not be successful in maintaining the reduction of the fracture due to the action of the muscles alluded to above. In addition, the apparatus itself may be uncomfortable for the patient and the pins may cause problems with the tendons if they transfix them. Pin track infections can also be a problem. 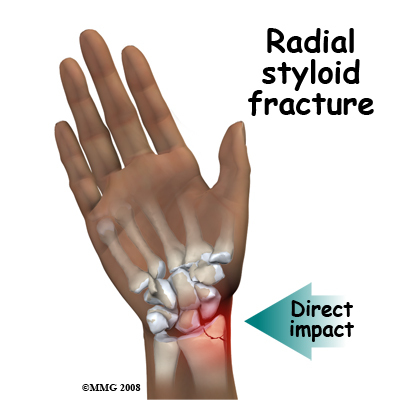 This technique has gained popularity and is the preferred method of treatment by many surgeons for unstable distal radius fractures. For this technique the bone is exposed by an incision on the front or back of the wrist depending on the exact anatomy of the injury. The fracture fragments are reduced into anatomical position and held there with a metal plate. Sometimes additional bone (a bone graft) is also inserted into the fracture to make it stronger and speed up healing. The advantage of this technique is that the bone fragments can be put back in position more easily under direct visual control and the fixation is stronger. It is not always necessary to remove the fixation (implant) after healing. Casting is not needed after the surgery although the wrist may be splinted for comfort. It is usually possible to move the wrist early on and this is encouraged to help prevent stiffness. This option has been suggested for patients with a light job who need to return to work as early as possible. The main disadvantages of ORIF are the greater exposure of the fracture, which leads to concerns about infection and loss of blood supply, and the longer more elaborate surgery that may cause greater stress to the patient. Many surgeons prefer nonsurgical methods of treatment for elderly patients, who often have multiple medical problems. In addition, many surgeons are not confident that there is convincing evidence, which shows that ORIF makes a major difference to the long-term function of elderly patients who have low demands. Despite the commonness of the problem it is difficult to study these issues and settle them once for all. Complications are events or conditions that make the process of recovering from the fracture more complex. Although most complications are rare, much of the management of the injury is directed at avoiding complications, detecting them early and treating them if they occur. Doctors, nurses and Physical Therapists will ask patients to move their fingers right after an operation on the wrist as these early movements can help to detect early complications. The term malunion implies that the fracture has healed but is not in the correct anatomic position. 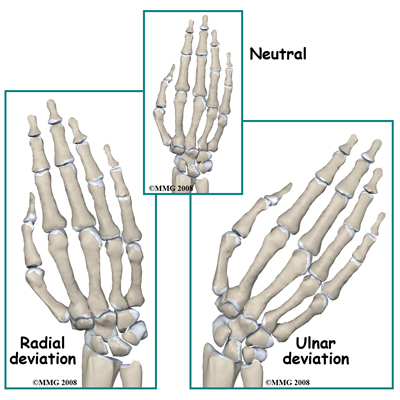 There are three aspects of malunion of distal radius fractures that give rise to concern 1) irregularity of the distal radius joint surface, 2) tilting of the joint surface, and 3) shortening of the radius. A gap or step in the joint surface greater than 1 mm is a cause for concern as it increases the long-term possibility arthritis of the joint. Post-traumatic arthritis of the joint is actually quite rare and there is still no absolute certainty about the amount of irregularity that will cause it. Most doctors agree, however, that an irregular joint surface should be avoided if possible. Tilt of the distal radius is even more difficult to evaluate. A severe degree of tilt affects the distal radioulnar joint and rotation of the forearm. Although, once again, there is no consensus, many doctors prefer to avoid a high angle of tilt and would operate to prevent it. Shortening of the radius results in impingement between the ulna and the carpal bones, which is often painful. Preventing malunion is important, as the treatment for it is difficult. Once the bone is healed it is a major undertaking to "take down" the fracture by surgery and fix it into a better position. A "wait and see" approach is often preferred rather than an immediate surgical procedure to fix a malunion. If another surgery is required, there are various operations used for reconstruction of a painful or poorly functioning wrist. The median and ulnar nerves are often compressed by the impact of a fall and may be damaged to the extent that their function is affected. Once this is established it may be necessary to decompress the nerve. Recovery after this surgery is usually complete but delay in treating a nerve injury should be avoided. If you have numbness in your hand after a fracture you must immediately inform your doctor about it. Another source of nerve injury is from the hardware used to treat the fracture. Pins inserted through the skin may come close to or penetrate into nerves that pass over the fracture. The radial nerve on the thumb side of the wrist is quite vulnerable to this type of injury. It causes pain similar to an electric shock and may also cause numbness, however most often this resolves when the pin is removed. Damage to a nerve may also result in a sensitive, tender scar. Fractures of the distal radius cause damage to the muscles of the forearm and involve bleeding into the muscle compartments. Both these processes cause increased pressure in the muscle compartments, which may be further increased by bandages or casts. If the pressure gets too high the blood supply of the muscle tissue is impaired causing further damage and a further increase in intra-compartment pressure. The hallmark symptom of compartment syndrome is relentlessly increasing pain made worse by active or passive finger movements. For this reason patients are encouraged to move their fingers as soon as possible so any unwarranted pain can be detected. If it is only mildly uncomfortable this is evidence against a compartment syndrome. Once established, compartment syndrome tends to get worse and cause muscle death with long lasting disability. The treatment is to immediately operate to open up the muscle compartments and relieve the pressure (fasciotomy). If this is done before any muscle dies the results are excellent although the scars on the forearm may be dramatic. If the skin is wounded either by the accident (causing an open fracture) or by surgery there is a chance that bacteria will infect the wound. Antibiotics are often routinely prescribed to reduce the chance of this happening. The risk of an infection following an operation with modern treatment is less than 2% (one in 50) but this is little consolation to you if you do get an infection. Signs and symptoms of an infection include increased wound swelling, increased redness, increased tenderness, and the possibility of pus draining from the wound. It is normal to have a slight fever after an operation but with an infection this tends to go up and lasts longer. Cultures taken of the blood or drainage from the wound may reveal the bacteria responsible and assist in treatment. The mainstay of treatment is the prolonged use of high-dose bacteria-specific antibiotics but further surgery is also very common. With surgery the wound is opened and washed out to reduce the number of bacteria and give the antibiotics a fighting chance. Sometimes the wound may be packed with antibiotic beads to increase the local concentration of the drug. Once the infection is under control the fracture should heal, however it may be necessary to remove all the metal implants as bacteria tend to grow on foreign material. In the majority of cases the combination of early aggressive antibiotic treatment, wound washout, and removal of the hardware once the fracture is healed is successful in restoring the wrist to normal after an infection. This troublesome problem results in burning pain, swelling, and stiffness of the hand and wrist even though the fracture has healed. Normally after an injury the blood supply is increased to the injured area as part of the body's marshaling of resources. Generally this increase only lasts a few days post-injury and then the blood supply returns to normal levels. After some wrist fractures, however, this does not happen and the increased blood supply causes prolonged swelling. This in turn makes it difficult to move the hand and wrist. As a result everything stiffens up and attempts to move the wrist are unusually painful. It is not clear why CRPS occurs although there is a connection between pain and the blood supply reflex. CRPS was previously called Reflex Sympathetic Dystrophy (RSD) so this term may still be used but refers to the same process. The pumping action of the muscles helps to reduce swelling therefore CRPS is less common if you get the fingers, hand and wrist moving early. This is another reason why you are asked by the Physical Therapist and other health care professionals to move your fingers right away. Treatment of established CRPS is different for different individuals but includes exercises prescribed by a Physical Therapist, splints to eliminate the stiffness, medication for the pain, and compression gloves to help reduce the swelling. Nerve blocks may be helpful both for diagnosis and treatment. The prognosis of CRPS is good with most people recovering, however it may take a long time for complete recovery to occur. Most implants that are used to stabilize fractures are made of metal and therefore subject to metal fatigue. Metal fatigue is a similar process as to when you want to shorten a piece of wire and so to do this you repeatedly bend it back and forth until it breaks. A metal implant, such as a wire or a plate that crosses over an unhealed fracture, also bends. This movement is very small but "micromovement" does occur at fractures and the stress is transmitted to the implant. Once the fracture is healed this micromovement stops and there is almost no load on the hardware. It is a race between the bone healing and the implant breaking, which, in most cases, is won handily by the healing process. Unfortunately, under some circumstances the hardware does fatigue and fail. If you carry loads or use vibrating machinery before the fracture is healed, this greatly increases the tendency of fatigue failure. The restrictions on activities such as lifting weights or riding a motorcycle too early may seem unnecessary or overcautious when your wrist is feeling strong and comfortable and when these activities do not hurt, however, the restrictions are based on the length of time it takes the bone to heal. Until the bone is healed loading the hardware may have unexpectedly serious results. The risk of fatigue failure is also increased by smaller implants, with delay in healing, and with infection. Gaps between the bone fragments may also increase the tendency of the metal to fatigue. If the implant does break the bone may still heal in the current position if protected by a cast (and if you stop the activities that loaded it). Alternatively, surgery may be repeated using a bone graft, which promotes healing and stabilizes the fracture. Luckily, in the long term this complication is often seen as a "bump in the road" as the measures to heal the fracture usually succeed in the end. Pins, plates and screws are often used in the surgical treatment of distal radius fractures. The location of these items of hardware often means that the tendons that pass to the hand need to glide over the plate or the protruding ends of the pins and screws. In a small percentage of cases the tendons are irritated and may even rupture. This is a relatively common complication of plates on the back of the wrist where there isn't much room for the tendons. The main symptoms are pain in the wrist region when moving the fingers or thumb, and tenderness to the touch. If the tendon does rupture this will generally affect one specific movement such as straightening the thumb or index finger. The treatment for this complication is to remove the hardware that is causing the trouble. If the fracture is not healed, however, some other method of treatment may be necessary such as moving the plate to a different surface or into a different position. The bone of the distal radius is cancellous (spongy) and heals very well. New bone formation is often evident on x-ray at three weeks post injury but most surgeons keep the fixation in place or the cast on for six weeks. Non-union is rare. As with most bones it takes about three months for the bone to consolidate at the fracture site and to be strong enough to use normally. Overall bone and joint function, however, continue to improve for up to 18 months after a fracture. If the bone has been compressed and there are gaps between the fracture fragments the process of healing may take longer. Healing times are not usually affected by surgery, which means that the bone does not heal any quicker if it has been operated on. If your fracture has been treated by immobilization in a cast, then rehabilitation with a Physical Therapist at Barkman & Smith Physical Therapy can begin once the cast is removed. While you are in the cast simple finger movements as well as exercises to maintain your shoulder range of motion, such as lifting your arm overhead, will be your only exercises. If you have had surgery to fixate your forearm fracture, then rehabilitation at Barkman & Smith Physical Therapy will begin as soon as your surgeon allows it. Each surgeon will set his or her own specific activity restrictions based on the type of fracture, the surgical procedure used, their personal experience, and whether or not the fracture is healing as expected. Generally, however, early non-weight bearing hand, wrist, and elbow movements will be allowed. Even if extensive Physical Therapy for your wrist is not yet appropriate, at Barkman & Smith Physical Therapy we highly recommend maintaining the rest of your body’s fitness with regular exercise. Even older adults can reap benefits from maintaining their general fitness while their wrist fracture heals. Activities such as walking or using a stationary bike or stepper machine are easy activities that can be done even while the wrist fracture is healing. Avid runners may even be able to continue running with clearance from their doctor. Weights or weight machines for your lower extremity and opposite arm are also acceptable to use as long as the restrictions regarding your healing wrist are strictly abided by. Generally, lifting any weight with your injured limb will not be allowed while your wrist heals so you may require a friend to assist you with your workout setup if you are keen to continue during this time. Your Physical Therapist at Barkman & Smith Physical Therapy can discuss the most appropriate way for you to maintain your fitness while abiding by your doctor’s restrictions, and can provide a general fitness program specific to your needs. When the initial cast is removed or immediately after surgery, you may experience some pain when you start to move your wrist, elbow and forearm. If you were immobilized this pain is from not using the joints regularly. If you have had surgery, the pain is likely from the surgical process itself. Your pain may also be from concurrent soft tissue injury that occurred when you fractured your wrist. Your Physical Therapist at Barkman & Smith Physical Therapy will focus initially on relieving your pain. We may use modalities such as heat, ice, ultrasound, or electrical current to assist with decreasing any pain or swelling you have around the fracture site or anywhere along the arm or into the hand. In addition, we may massage the hand, forearm, wrist, or elbow to improve circulation and also assist with the pain. The next part of your treatment will focus on regaining the range of motion, strength, and dexterity in your wrist, hand, elbow, and shoulder. Your Physical Therapist at Barkman & Smith Physical Therapy will prescribe a series of stretching and strengthening exercises that you will practice in the clinic and also learn to do as part of your home exercise program. These exercises may include the use of rehabilitation equipment such as pliable balls, exercise bands, or small weights that provide added resistance for your hand and wrist. Your Physical Therapist may even give you exercises for your shoulder. The shoulder is the link from the wrist and hand to the rest of the body so it needs to be strong and well controlled for the upper limb, particularly the wrist and hand, to work well. Your initial exercises will include those that do not put any of your body weight through the wrist, so you may simply just be moving the wrist back and forth, turning your palm up and down, or lifting a small weight. As your healing wrist allows, your Physical Therapist will add in exercises where you are putting some of your body weight through your wrist via your hand such as pushing on a door or doing push ups against a wall. If necessary, your Physical Therapist will mobilize your joints in order to gain range of motion. This hands-on technique encourages any stiff joints in your wrist, hand and elbow to move gradually into their normal range of motion. As a result of any injury, the receptors in your joints and ligaments that assist with proprioception (the ability to know where your body is without looking at it) decline in function. A period of immobilization will add to this decline. Although your wrist is not traditionally thought of as a weight-bearing joint, even activities such as pushing up to get off of the couch, pulling a glass from a cupboard, or pushing a door open, require weight to be put through or lifted by your wrist and for your body to be proprioceptively aware of your limb. If you are active in sport, then proprioception of your upper extremity is paramount in returning you to your sport after a wrist fracture. Your Physical Therapist at Barkman & Smith Physical Therapy will prescribe exercises for you to regain this proprioception. These exercises may include activities such rolling a ball on a surface with your hand, holding a weight up overhead while moving your shoulder, or push ups on an unstable surface. Advanced exercises will include exercises such as ball throwing or catching. If your wrist fracture has occurred as a result of an accidental fall, your Physical Therapist will also assess your balance and give you exercises to improve your balance. They may also discuss other strategies you can implement to avoid falling again, such as removing throw rugs in your home or changing your footwear. Preventing another fall is extremely important particularly if you are at risk of falling due to your age or some other medical reason, or if your bones are osteoporotic. Fortunately, gaining range of motion, strength, and proprioception after a wrist fracture occurs quickly. You will notice improvements in the functioning of your wrist even after just a few treatments at Barkman & Smith Physical Therapy. As you improve, we will advance your exercises to ensure your rehabilitation is progressing as quickly as your healing wrist allows. Once your wrist can tolerate it, advanced exercises may include things such as holding a push up position with your hands on a basketball, or dips in a chair where you are taking nearly your whole body weight through your wrist. Generally, the strength and stiffness one experiences after a wrist fracture responds very well to the Physical Therapy we provide at Barkman & Smith Physical Therapy. If, however, your pain continues longer than it should or therapy is not progressing as your Barkman & Smith Physical Therapy Physical Therapist would expect, we will ask you to follow-up with your doctor to confirm that the fracture site is tolerating the rehabilitation well and, if you have had surgery, to ensure that there are no hardware issues that may be impeding your recovery. Long-term function after a wrist fracture is difficult to predict. In elderly people, who are the population most at risk for wrist fractures, it is difficult to measure function. What may occur is that the patient accepts some stiffness and pain after the fracture, doesn’t complain, and finds other ways to manage activities of daily living. Due to these adaptations, for many years, it was believed that the long-term outcome after a wrist fracture was good even if there was significant residual collapse and deformity. The more that long-term function is studied, however, the more this view is challenged. It is probably more true to say that those patients adapt to a residual wrist problem than to say there is no problem in the long-term.